This is part 1 of a 2 part series. Part 2 is here. As you can see, since the three lines here have their steepest upwards slopes at different times, there are a myriad of possibilities for cherry-picking endpoints to make whatever point you want to make. I would say this is a pretty healthy picture, with real income growth for everyone, though the general flatness of the middle income brackets since 2007 seems to get the most notice. A healthy and growing economy should cause all of these quintiles to grow. But income growth and mobility for individuals is about more than just the quintiles. As a small business owner over the last 20 years, I have had tax returns in all five quintiles -- I have had blowout years when I was "rich" and I have had years when my taxable income would qualify me for food stamps. In other words, I move between the lines -- and so do a lot of other people. Young people gaining experience and promotions move from lower to higher quintiles as they age. New immigrants often come in at the bottom and progress over time. When people retire, they may fall down a few quintiles. Marriage might kick someone up to a higher quintile, and divorce may lead to them falling down a few. There is a constant ebb and flow that is hidden by merely looking at quintiles. This first study, from the Pew Charitable Trusts, conducted by Leonard Lopoo and Thomas DeLeire uses the Panel Study of Income Dynamics (PSID) and compares the family incomes of children to the income of their parents.⁴ Parents income is taken from a series of years in the 1960s. Children’s income is taken from a series of years in the early 2000s. As shown in Figure 1, 84% earned more than their parents, corrected for inflation. But 93% of the children in the poorest households, the bottom 20%, surpassed their parents. 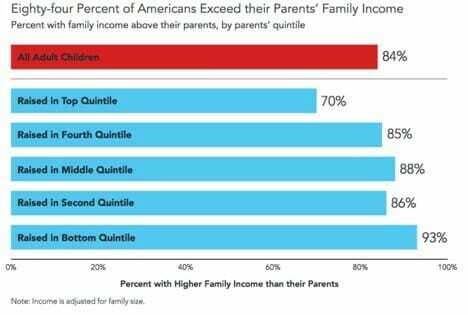 Only 70% of those raised in the top quintile exceeded their parent’s income. ... Julia Isaacs’s study for the Pew Charitable Trusts finds that children raised in the poorest families made the largest gains as adults relative to children born into richer families. He has a lot more at the link. In part 2, I will discuss why public policy is missing the boat, and in some cases doing exactly the wrong thing, to promote income mobility particularly for the poor.